Since DirtFish was started with the love of rally racing in mind, a rally team was naturally the next step for us. DirtFish is all about rally and we want to see the sport develop and grow. You will see DirtFish employees and drivers at multiple events across the United States and Canada throughout 2017. Whether in our in-house designed and built Subaru STI and Subaru BRZ or our employees race cars, all generations of Subarus, Saabs and Fords, our DirtFish flag will fly. Drivers, co-drivers and technicians from every department at DirtFish will be out competing on stages or working as crew. We are proud to support racers and racing series throughout the United States and Canada including the Canadian Rally Championship, SCCA Rallycross and RallySprint (where we find our future stage competitors), the Cascadia International Rally Championship, American Rally Association, NASA Rally Sport, Rally America and the Subaru Rally Team. You will see our brand placed on cars throughout North America. In addition to beautiful roads, scenic destinations and the grit and determination of the sport, there are huge opportunities for participation beyond being in the car. As most events are primarily volunteer run, the organizations are always seeking support. Please be in touch if you have ever been curious about getting involved and we will point you in the right direction. It’s a great way to start your rally career. DirtFish is an advanced driving school located in Snoqualmie, Washington, USA only 30 minutes from Seattle. We offer driver instruction, training and coaching programs and experiences for advanced car control, driver development, road and circuit racing, motorsports, SCCA rallycross, stage rally, EVOC and tactical, stunt driving, teen drivers, new drivers, track days, track racing, off-road truck racing, winter snow and ice driving, formula and open-wheel car racing, high performance driving, autocross, desert racing, overland and defensive driving, providing confidence and safety techniques behind the wheel. Being one of the top rally schools in the USA, we teach advanced car control techniques used in racing series and circuits, such as World Rally Championship, WRC, Rally America, Canadian Rally Championship, Red Bull Global Rallycross, Cascadia International Rally Championship and FIA World Rallycross. 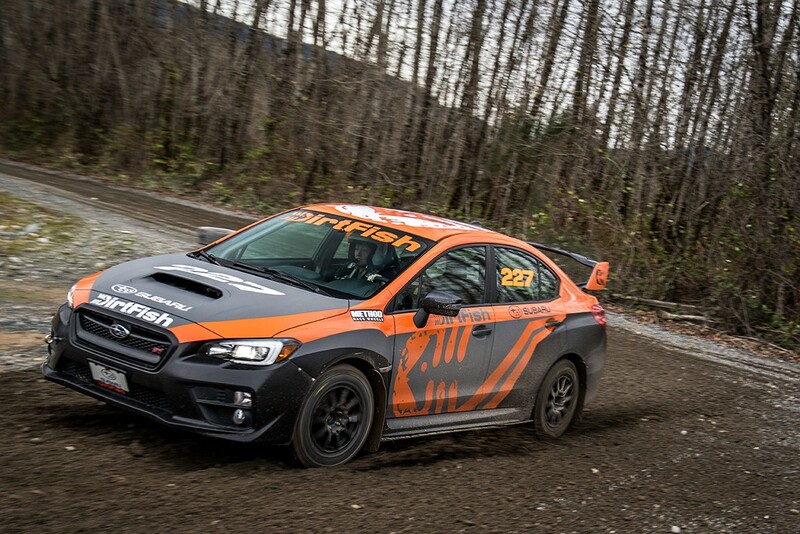 DirtFish utilizes courses on multiple loose surfaces conditions; dirt, mud, gravel, tarmac, pavement, and other sealed surfaces using the all-wheel AWD drive Subaru WRX STI and the rear-wheel drive RWD Subaru BRZ. Our high adrenaline programs, courses, and property boast the perfect location for your next event, activity or adventure, whether it’s corporate team building, sales incentive programs, arrive and drive programs, vehicle testing (Mudfest), property rentals, bachelor and birthday parties- we are capable of it all. Our property, facilities, and location have been used for many different film productions, most notably Top Gear, Twin Peaks and Roadkill. It is perfect for movies, commercials, promotional videos, stunt videos, viral videos and is a great scouting location. DirtFish has been featured in productions with Ken Block, Bucky Lasek, Launch Control, The Smoking Tire with Matt Farah, Forza, T-Mobile, Travis Pastrana, Toyota, Barnacles Nerdgasm and more. 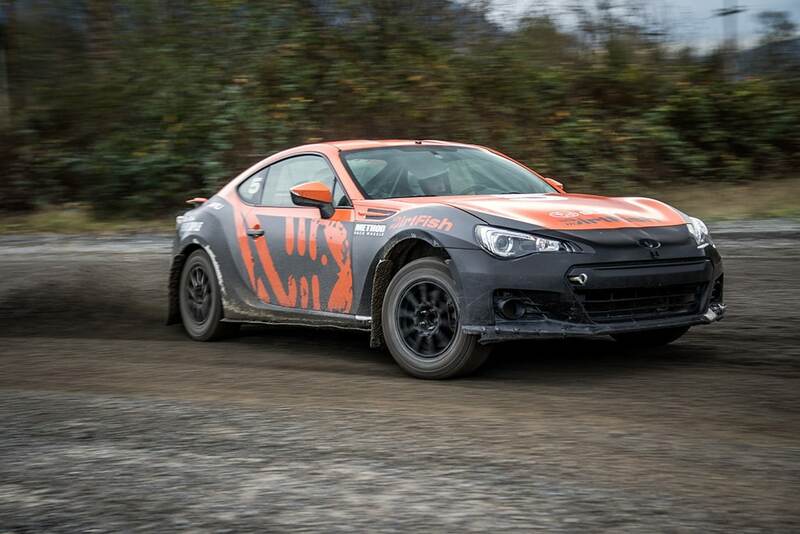 DirtFish has been compared but rated highest among other driving and car control schools, such as Team O’Neil, Bondurant, Bridgestone Winter Driving School, Florida International Rally & Motorsports Park FIRM, Proformance at Pacific Raceways, Skip Barber, Rally Ready and The Ridge Motorsports park. If you’re making travel plans and have some time to kill during your vacation, or are looking for a last minute deal, check out our DirtFish Signature Thrill Rides or our DirtFish Driving Simulator, equipped with XBOX, PC, Playseat, Logitec and Fanatec products that is primed and ready with Forza, Project Cars and Dirt Rally. Stay current with all the latest information from DirtFish. Share all the good stuff with your friends and help DirtFish tell the world about Rally. Copyright © 2019 DirtFish Rally School. All rights reserved. Every rally car requires a welded-in safety cage. The roll cages in our cars are built in-house from scratch. Driver and co-driver need to be firmly mounted to the structure of the vehicle. The use of hinged-back seats in rally vehicles is prohibited in rally and most forms of racing. Safety first. A minimum of a 5-point harness is required by all American rally sanctioning bodies. The 5 points consist of 2 shoulder harness, 2 lap belts and a single anti-submarine belt (not shown). Most rally cars use a hydraulic handbrake. The purpose of the handbrake maneuver is to turn a car around a very tight corner by locking up the rear wheels to aid the rotation of the car around the corner. The Subary BRZ is powered by a 2.0 liter naturally aspirated Boxer engine. The Subaru BRZ is rear-wheel-drive and equipped with a limited slip differential. Being a rally school, we spend most of our time on gravel roads. To maximize the learning experience, we outfit all of our cars with the latest gravel rally tires for maximum traction. It is very important to have a durably strong, yet lightweight rally wheel that can hold up to constant abuse, rocks, rough roads and punctures. At DirtFish, we use and trust Method Race Wheels. Rally is rarely on a perfectly smooth roads, because of that rally cars require suspension that can take the abuse. We choose to use Reiger rally suspension on our cars. Rally cars commonly use a 15″ rally wheel. Luckily with the Subaru BRZ’s, the stock brake system is more than adequate for our programs. Driving at high speeds over variable surfaces can easily damage parts. With the constant spray of gravel that gets thrown at them, skid plates and urethane underbody protection help with the longevity of the underbody of the cars. Most rally cars use a hydraulic handbrake. The purpose of the handbrake maneuver is to turn a car around a very tight corner by locking up the rear wheels aiding in the rotation of the car around the corner. Our Subaru STi’s use a 2.5 liter 4-cylinder Turbo-charged Boxer engine. The Subaru STi is equipped with an advanced all-wheel-drive system with an active center differential. Rally cars commonly use a 15″ rally wheel. In order for the wheels to fit on our Subaru STi’s, we had to convert them to a Group N brake setup. What are some of the differences between All-Wheel Drive and Rear-Wheel Drive? All-Wheel Drive cars have more traction (naturally) and can therefore attain higher speeds in a shorter space, but require very precise driving to extract the most from them. Rear-Wheel Drive is quite challenging, requiring a lot of throttle control and very smooth inputs. It’s incredibly fun and sideways, and the ability to successfully handle a Rear-Wheel Drive car through slippery rally conditions is quite rewarding. Both are incredibly fun, and will increase your driving ability and car control beyond what’s possible on a track. Take a tour of our headquarters! A birds-eye view of DirtFish Rally School. Below you will find an aerial view of the DirtFish property. Go through and check out the courses you’ll be driving on during your driving program! View everything from The Slalom all the way up to our longest course, the Advanced Mill Run!